THE property market saw a continued slowdown into the fourth quarter of 2014 (4Q2014) and this is expected to extend into 2015, says Nabeel Hussain, associate director of Savills Malaysia (formerly CB Richard Ellis Malaysia). Presenting The Edge/Savills Malaysia Klang Valley Housing Monitor 4Q2014, he says that buyers continue to be cautious, not just about the property market but the overall economy as well. The supply of 1-storey terraced houses is limited in mature areas like Taman Tun Dr Ismail (TTDI) and Bangsar, with rising land prices making it less feasible to build these units. But there is still demand for this segment, and limited supply has pushed up prices, especially in popular locations such as Bangsar. 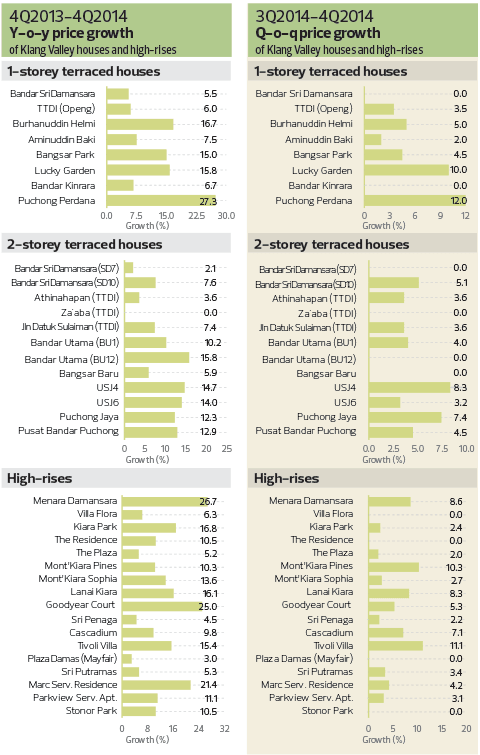 Prices of 1-storey terraced houses during the quarter under review remained stable, with noticeable increases quarter-on-quarter (q-o-q) in areas such as Lucky Garden (10%) and Puchong Perdana (12%). Consistent positive growth was seen in TTDI and Bangsar, as well as mature areas in Petaling Jaya. The price of a 1-storey terraced house in Bangsar Park increased to RM1.15 million in 4Q2014 from RM1 million in the previous quarter. Meanwhile, a similar type in TTDI Openg rose to RM880,000 from RM850,000 q-o-q. Other areas that have become popular are Bandar Sri Damansara for its much improved access and close proximity to the city as well as Bandar Kinrara and Puchong Perdana for their good access to highways and close proximity to the new LRT extension stations, says Nabeel. The prices of 1-storey terraced house have risen almost 13% on average, besting high-rise units. In areas such as Puchong Perdana, the appreciation is believed to have exceeded 25%. Nabeel notes that many homeowners or buyers of 1-storey terraced houses turn their units into 1½ or 2-storey units if they are allowed to by the local authorities. This will further enhance the value of existing homes. In view of the lack of new and existing supply and the high demand, he foresees that 1-storey terraced house will continue to enjoy price growth in the coming quarters. In 4Q2014, this segment saw an average price growth of 8%, including in mature areas like Bangsar and Petaling Jaya. Areas such as USJ 4 and Bandar Puchong Jaya saw higher price growth of 8.33% and 7.35%, respectively. Price growth in new suburban areas may be higher compared with mature areas, he says. Two-storey terraced houses in Bandar Puchong Jaya increased to RM730,000 in 4Q2014 from RM680,000 in 3Q2014. Meanwhile, in TTDI Athinahapan, prices rose to RM1.45 million from RM1.4 million in the previous quarter. Overall, the data showed healthy price growth in mature areas such as Bangsar, TTDI, Petaling Jaya, Subang, USJ, Shah Alam, Cheras and Kajang. “The existing and improving accessibility plus superior facilities have long cemented demand for these areas. Announcement of the upcoming MRT Line 1 and Line 2 has also led to more activity in areas around the stations,” says Nabeel. This segment, he adds, will register healthy long-term price growth due to its strong fundamentals. “Recently, the prices of 2-storey terraced houses in Aman Suria in Petaling Jaya, Bandar Utama (BU6) and TTDI reached between RM1.5 million and RM2 million. “Newer 2- to 3-storey terraced houses in developments launched in Kuala Lumpur and Petaling Jaya are also priced above RM1.5 million, which is double the values seen in more distant suburban areas,” Nabeel says. He explains that with developers building more houses in suburban areas, homebuyers have a choice of getting a 2-storey terraced house in a secondary location or paying a premium for one in more central areas. From the data and transactions, it is clear that many buyers prefer to live in suburban areas as long as road accessibility and infrastructure are good, with ample amenities nearby. The higher transaction volume for high-rise residential units was driven by the lack of affordable landed properties in central areas. Nabeel notes that high-rise units are priced from RM400,000 to well over RM1 million depending on the size, location and other factors. Apart from that, such developments often offer better facilities, greater security, easier maintenance and a more “vibrant” living environment. High-rise residential units in the secondary market in areas such as KLCC, Bangsar, Mont’ Kiara, TTDI and Bandar Sri Damansara have experienced price growth because of continued strong demand. The current prices of existing units are often below those of new launches, giving them a value advantage. The data showed positive price growth in areas such as KLCC, Bangsar, TTDI, Sri Hartamas and Mont’Kiara, which are the most popular areas because of their established communities, convenience and safety. In general, values of secondary units in most parts of the Klang Valley have appreciated over the past periods, says Nabeel. During the quarter under review, Parkview Service Apartments at KLCC saw prices rise to RM500,000 in 4Q2014 from RM485,000 in 3Q2014. Tivoli Villa increased to RM600,000 from RM540,000 while Kiara Park prices rose 2.35% to RM870,000 q-o-q. “Mature areas will continue to see price growth. TTDI, Mont’Kiara and KLCC units within our coverage are enjoying price growth of 10% to 25%,” says Nabeel. Despite the increasing supply, high-rise residential units will continue to be affordable and should enjoy healthy demand. “It has become socially acceptable to live in higher density residential developments because of better management, security and facilities offered by these developments, with reasonable pricing. “With a slowdown in the property market, we would focus on more liveable units — those that offer slightly more space and better facilities as these are more likely to persist in the face of a more competitive environment,” Nabeel says. He expects 2015 to be a period of stabilisation with continued concerns about the economy and the imposition of the Goods and Services Tax, lower prices for crude oil and other resources, as well as potential hikes in interest rates. This article first appeared in City & Country, The Edge Malaysia Weekly, on March 9 - 15, 2015.